As we were heading up the East Coast from Florida we were hearing mosquitoes and flies in the salon and kitchen. At first we were amazed as we were over 40 miles off shore where there are normally few flying insects, then we were curious as we could not see a single fly or mosquito. On closer inspection we determined that they were in the freezer!! Something in the fridge was buzzing, we looked for moving parts, where a fan might be hitting a wire, or a pulley wheel rubbing, but nothing was visible. 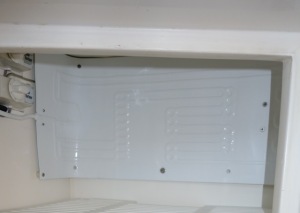 The noise was coming from inside the fridge in what appeared to be the upper back side. We have been looking at intelligent temperature controllers for the fridge/freezer as part of our energy audit of the boat. 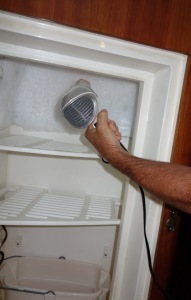 So we brought out a boat freezer expert to talk through ideas on the controller and to look for those pesky mosquitoes. First the mosquito noises: turns out they were a result of the cooling plate in the refrigerator vibrating due to the change in state of the coolant from solid to gas inside that plate. 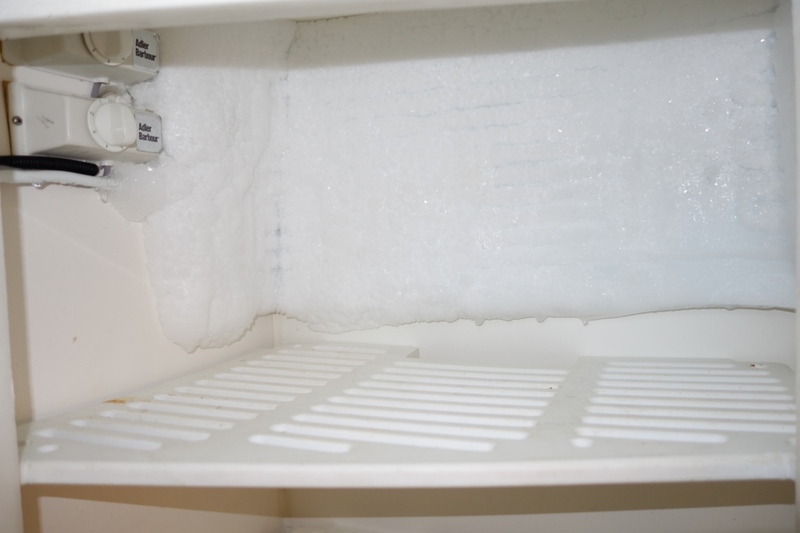 Upon inspecting the fridge, it became obvious we were overdue for a defrost — more like we needed a glacial melt. 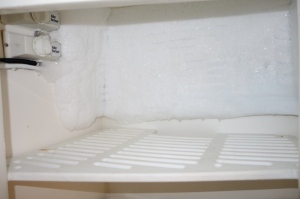 (Please note that if you use a hair dryer in a fridge like this, be sure that the ceiling of the unit is dry: free of ice and water, so you do not get drips on your hand and then into the hair dryer. No Darwin Awards from this blog). So out came all the food and the hair dryer and we started the first Golden Glow Warming. The plate had 2 inches of ice in some places. A total of over 1.5 gallons of water after melt down. Why? Well. the obvious answer was that the moist air in the southern climate had condensed over the last several months. But that much? Our freezer expert suggested we do a test of the seal on the door. Antares fridge space is stated as being the most expensive part of the boat, cubic inch to cubic inch. 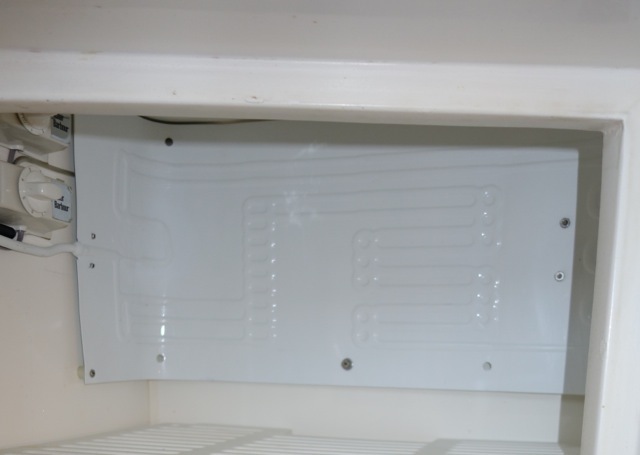 It is done right, the fridge and freezer doors are double sealed, so we tested where the inner seal was first. By first cleaning off, then wiping dish washing soap on the inner door opposite the seal, and then closing the door and reopening it, we looked at what soap had found its way onto the seal. To our surprise, less than than 10% of the inner seal was making contact with the opposite side of the door it was meant seal!!! This told us, we had some air leaks adding to the frosting as well. That helped explain why we were seeing so much frost and ice in the first place. 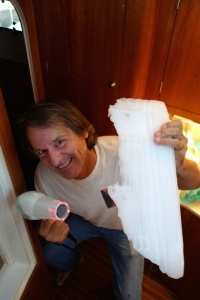 Now for the cool insight on the energy audit: one of the primary needs for the intelligent fridge/freezer temperature controller was to reduce what is called “rapid-cycling” where the unit goes on and off in short periods of time. We were told this is a symptom of an air leak, and the intelligent controllers can mask this problem. After some further discussion of other advantages of an external temperature indicator and remote controller, we decided to start with an indoor/outdoor temperature sensor in the fridge/freezer, wirelessly connected to an outside digital read-out. Thus, a $400 unneeded option is replaced with an equally effective $20 solution. That is the kind of ‘expert’ we like on Golden Glow.